There are various ways in which gender is acknowledged in health promotion. In 2000, Geeta Rao Gupta challenged the audience at the XIIIth International AIDS conference in Durban, South Africa to consider the ways that gender norms, roles and relations contributed to furthering the HIV/AIDS epidemic. Building on work she’d done examining HIV interventions (29), Gupta argued that those offering prevention, diagnostic and treatment programs for HIV/AIDS needed to understand how their efforts may exploit, accommodate or transform the gender norms, roles and relations that put men and women at risk for contracting HIV, infecting others, and/or seeking diagnostic or treatment services: “To effectively address the intersection between HIV/AIDS and gender and sexuality requires that interventions should, at the very least, not reinforce damaging gender and sexual stereotypes” (30). We built on these ideas and created the diagram above. 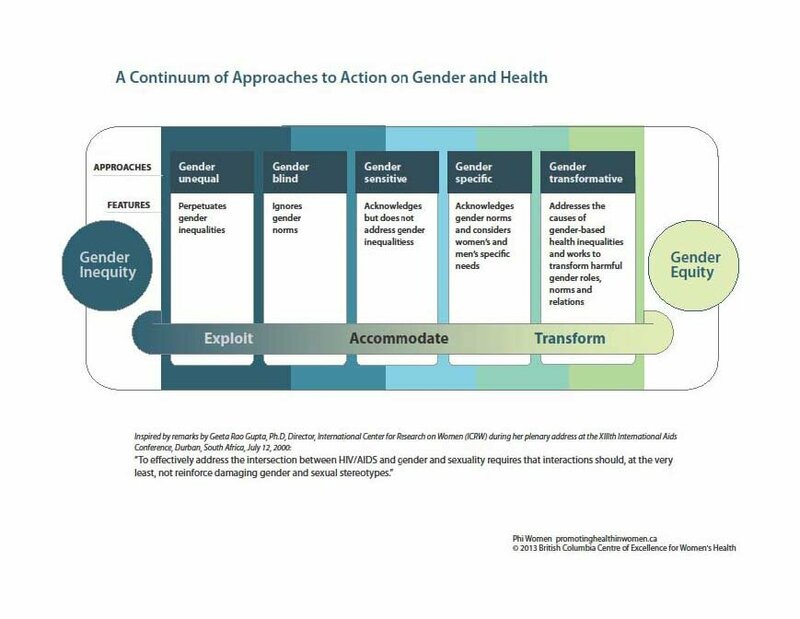 This illustration (7) shows an array of approaches along a continuum, from gender inequity to gender equity, identifying approaches ranging from those which are gender unequal to gender blind to gender sensitive to gender specific to gender transformative. To understand this continuum, and its implications for health promotion research, policy and practice, it helps to review the features of each approach.